Engineering Solutions for Amputees Matt Lubas '18 spent the summer in Zacapa, Guatamala, working at a prosthetic clinic for the Range of Motion Project. Matt Lubas ’18 (right) shoots a selfie with new friends during a prosthetics clinic hike. Matt Lubas ’18 (third from left) hikes with fellow staff and clients of ROMP (Range of Motion Project) in Zacapa, Guatemala. Matt Lubas ’18 helps a young girl during a hike for the prosthetics clinic ROMP (Range of Motion Project) in Zacapa, Guatemala. This summer I worked with ROMP (Range of Motion Project) in Zacapa, Guatemala, at their prosthetic clinic. The clinic is one of the very few locations providing high-quality prosthetic care in Guatemala, with many patients traveling half a day to receive consultations. I worked with the local staff to initiate a study of patient health through a validated survey, and to organize a Climb for ROMP event in Guatemala with patients with amputation (PWAs) and the Guatemalan staff. I also developed patient information sheets that describe the prosthetic process, maintenance of parts, exercise sheets, and information about amputation. In addition, I helped with remodeling of the clinic and creating 3D-printed prosthetic hands. This summer opportunity was made possible by the Shepherd International Internship Program grant. What did you like best about the location of your internship? Zacapa is in the eastern part of Guatemala. My favorite aspect was the view of the mountains from my apartment, and my commute into the city each day. An average day started at 6:30 a.m. when I woke up, took a quick cold-water shower, and cooked breakfast while catching up on the news. Around 8 a.m., I headed to the main road to hail a microbus for the 45-minute drive to the hospital in Zacapa. The clinic opens at 9 a.m. and closes around 5:15-5:30 p.m., and every day was different. At work, I interviewed patients in the process of a prosthetic fitting, and helped contractors with remodeling and security inputs. I called patients and tour companies to organize the Climb for ROMP event. Working with the clinic director, I got input on what is the most valuable content for the information sheets. I took lunch with my supervisor at around 1 p.m. at a restaurant called Mi Tierra. At the end of the day, we caught a microbus back to Teculutan, often stopping early to pick up groceries. Then, I cooked a rice, black beans and chicken dinner, and called my girlfriend and parents before heading to bed around 10 p.m.
What was the most rewarding and fulfilling part of your experience? Interacting with patients on patient surveys was very rewarding because I was able to hear about experiences from people around the country. They talked about the distances they traveled to receive this prosthetic care, stories of how their loss occurred, and what could be better with the current prosthetic system. I also felt fulfilled by the fact that measuring their self-reported health outcomes over time could help ROMP to evaluate their patient care, improve the role of the local staff, and help demonstrate the success of the ROMP clinic to sponsors. 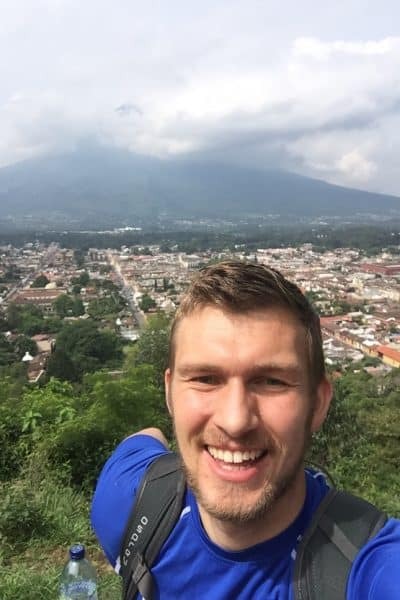 Matt Lubas ’18 snaps a selfie in Guatamala, where he spent the summer working at a prosthetic clinic. The biggest challenge I faced was most likely the week/weekend where I was very sick. I had a major runny nose, headache and cough, and had to take care of myself in the always hot and humid Zacapa, with only a fan and many mosquitos. It required me to go buy medicines and keep myself hydrated when I felt terrible. Other big challenges have been very low water pressure, having to go days without showering, managing bottled water for cleaning dishes and staying sanitary. Also, my computer that I need for work broke my first weekend, so I had to adapt and buy a new one in the city by myself. My supervisor, Jon Naber, definitely served as a mentor to me. He taught me a lot of things that he has learned from public health training, emphasizing patience in getting feedback and focusing on doing what it takes to keep moving the needle forward. At W&L, I have learned to manage multiple projects at the same time and work with friends and faculty for help and guidance on tasks. This has helped me to be flexible in my daily tasks at ROMP and adapt to urgent situations. I will be bringing back ideas for creating longer-term goals and focusing on ways that my engineering projects and club involvements have improved community engagement and continuity in international projects. This dive into prosthetic care has increased my interest in global health and technology for disability. From my readings and work in the clinic, I have had prospective changes on emphasizing the highest quality care/engineering solutions rather than the low-cost solutions. I have become more interested in finding ways that I can help improve local implementation of technology rather than improving the technology itself. I think an extended length experience in a developing world country is valuable no matter what your major. It requires stepping out of your comfort zone, whether on language, lifestyle or work done. It has the potential for students to meet amazing people and become more involved in issues that they care about.